You may be familiar with the advisory system (pictured at right) formerly used by the Department of Homeland Security to disseminate information regarding the risk of terrorist acts. Despite its being replaced by a new system in 2011, most of us remember the color-coded warning system that came in the wake of September 11. But, in the midst of a financial crisis (or when planning for a downturn), businesses need to be aware of their surroundings as well. To help companies analyze their environment to determine when action is necessary, we translated the Department of Homeland Security advisory system into the Strategic CFO Business Advisory System. Under the Best Case scenario, you’ve probably projected the crisis to resolve in less than 6 months. In this case, simple frugality might be enough to weather the storm. Generally, no systemic changes are needed to get through the trouble. Under the Worst Case scenario, you probably don’t expect the crisis to resolve within the next year. In fact, you may have no idea how long it will take for things to return to normal. In this case, you’re going to have to make some tough decisions to survive. You need to create a plan for each of the cases above. What will each case look like with regards to your financials – revenue projections, cash flow projections, etc. How much overhead can you carry in these stages? How do you know which stage of the Business Advisory System you’re in? This will require some serious evaluation of Key Performance Indicators (KPIs). You’ll need to know major KPIs in your industry. Once you have identified some KPIs, it’s time to track them. Track KPIs and analyze variances. Then you may use trend tools, what-if scenarios, and breakeven analyses. Monitor where you are on the Business Advisory System month-by-month and be prepared to take necessary steps to ensure that your business is profitable and cash-positive. Use KPIs to identify what stage of the Business Advisory System you are in. Create a plan for each stage so that you are ready to act if your KPIs indicate it’s time. 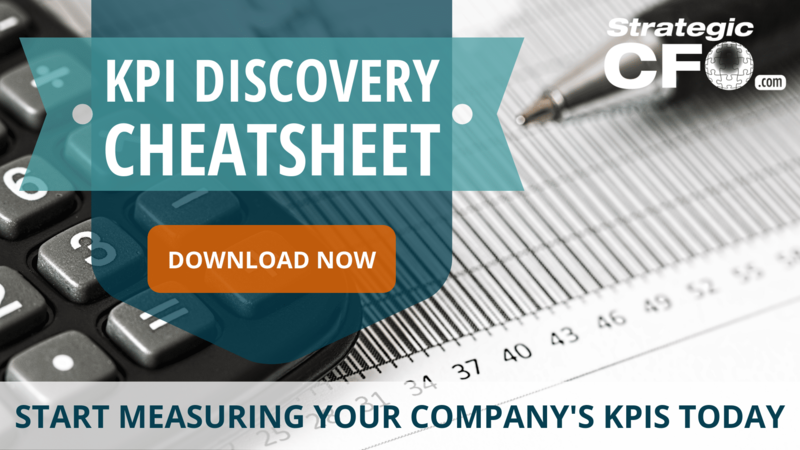 Download our free KPI Discovery Cheatsheet and start tracking your KPIs today! The break even analysis definition is the studying the path to the point where a company is neither losing money nor making a profit. It is very important to the survival of any start-up business. You can perform it for either products or the business as a whole. Reference the break even expenses as either pro or post-forma – that is before or after the company has been formed. This break even analysis is quite easy to do. The only critical piece of information that you will need to attain is a breakdown of the your firm’s expenses into Fixed Expenses and Variable Expenses. Once you have a breakdown of fixed costs and variable costs, input these costs into the template. You will also be able to conduct various “What if” scenario analyses to see how the breakeven revenue will change. Once you are able to arrive at the break even analysis, you can show the Owner(s)/Management this metric and make it part of their sales planning. Another idea might be to incorporate this metric into the Flash Report review meeting. This way your staff can know on a weekly basis if they are on track to at least breaking even. Shape your economics to result in profit! Let’s look at how to prepare a break even analysis. In order to successfully prepare a break even analysis, you need to gather and/or create the following financial information: Current Monthly Fixed Expenses (Dollar Basis), Current Monthly Variable Costs (as a Percentage of Revenue) and any “What if” scenario changes that you would like to consider. Note: This is optional depending on whether or not you would like to conduct a sensitivity analysis. Depending on the robustness of your financial system, you may or may not have some of the above inputs. As such, it may be necessary to first create them prior to working on the break even analysis. Once the initial break even analysis has been done, it will just be a question of maintaining it by inputting the most recent financial information. This maintenance can be done on either a monthly or quarterly basis. 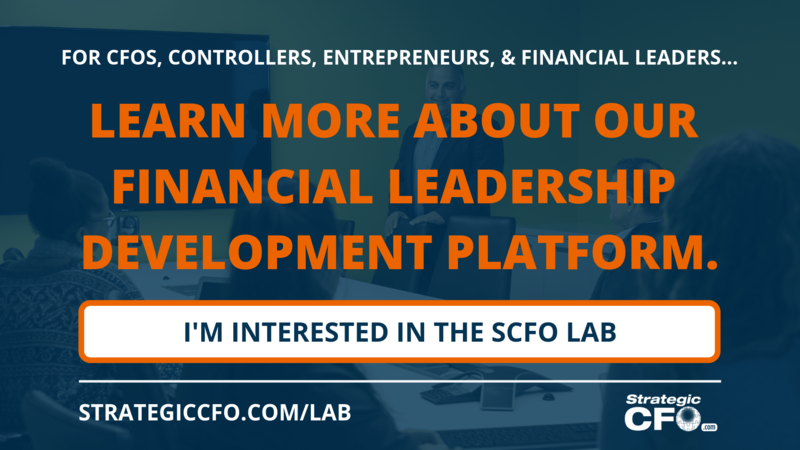 The CFO/controller should set it up. Another consideration would be to “outsource” the task to a consultant. Once you get the expense info, you will need to separate the list into a Fixed Expense portion and a Variable Expense portion. Also, as part of your break even analysis, you may want to discuss any “What if” scenarios with the Owner(s)/Management. They will be able to provide any direction you need with regards to changes in expenses going forward. Once the initial break even analysis is done, you can also input alternative scenarios under the “$ Change” OR “% Change” columns. Do not input data into both columns as the program will sum up both together. Once you have gathered and/or organized all the expenses into either the Fixed or Variable group, it will now be time to enter the appropriate data into the template. List each type of fixed expense under the “General and Admin/ Fixed Expenses” header. You can usually get this information off of your income statement. NOTE: Express fixed expenses in dollars. Input the dollar value of each fixed expense item under the “Base” heading. List each type of variable expenses will be entered under the “Variable Costs” header. You can usually get this information off of your income statement. NOTE: Variable expenses are expressed in terms of percentage of revenue. Input each variable expense item as a percentage of total revenue under the “Base” heading. Once the initial breakeven analysis is done, you can also input alternative scenarios under the “$ Change” OR “% Change” columns. Do not input data into both columns as the program will sum up both together. Input your changes in the areas highlighted EITHER in yellow or aquamarine. DO NOT enter changes in both columns as the program will sum up both columns. Input your changes in the yellow highlighted area only. The program will calculate the contribution margin and the sales necessary to achieve breakeven status. Please note that this break even analysis assumes a single/composite product line. You may want to use a more sophisticated approach to ascertain the break even point for a mixed product group. Once the break even analysis has been done, it will be very easy to update it. Line items on the income statement usually don’t change. However, it may be worth double-checking to make sure that no additional expense line items have been made. Having done so, it will simply be a matter of updating the figures for the expense line items. Once you have set up the initial break even analysis template, it will just be a question of maintaining it by inputing the most recent financial information. You can do this maintenance either on a monthly or quarterly basis. For example, Sly is considering starting a new business. Sly, an experienced business person and professional in his field of expertise, knows that proper planning is essential to consistent company profits. He wants to see that his company can survive before he creates it. Sly initially scours the internet for the keyword “break even calculator”. Unsatisfied with the result, Sly really wants to get his hands dirty. He decides to perform his own break even calculation on paper before he creates financial models. First, Sly estimates total revenue. He thinks about all of the products and services he would provide which create income. Now that he knows these he thinks about what he could sell them for. He does a little competitive research to find the standard market price for his products. Sly settles on this as a good point to begin his assumptions. He considers his products in reference to how many he can sell a year and decides he will be calculating break even points for each year. Then, Sly estimates total cost. He thinks about the resources needed to conduct business. Add overhead, cost of goods sold, salaries, and other factors. Once again Sly assumes the cost of these based on what he sees as the average cost of these resources in the market. He adds these together in regard to each year. Sly now has his total revenue and total cost per year. Though these are estimations, he is satisfied with this acceptable starting point. He moves on to subtract these total costs from his total revenues. Sly finds that he actually stands to loose, not gain, money from the business idea he is currently studying. Sly considers scraping his idea but decides to keep his notes and look deeper into the model. Though he has not found the results he is looking for, he is pleased to have performed a proforma break even analysis. In his current situation it is much worse than performing a post-forma break even analysis. A break even analysis template can be found at: S.C.O.R.E. Template Gallery. 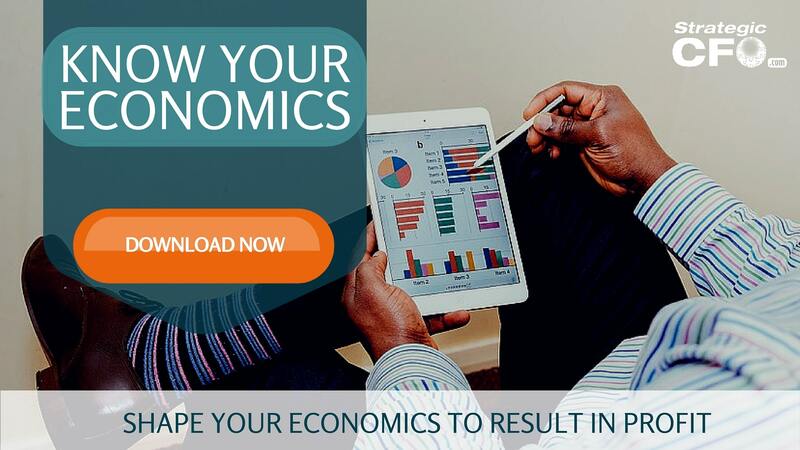 If you want to find out more about how you could utilize your unit economics to add more value, then click here to download the Know Your Economics Worksheet. A lot of people get confused about discounted cash flows (DCF) and its relation or difference to the net present value (NPV) and the internal rate of return (IRR). In fact, the internal rate of return and the net present value are a type of discounted cash flows analysis. Both the NPV and the IRR require taking estimated future payments from a project and discounting them into the Present Value (PV). The difference in short between the NPV and the IRR is that the NPV shows a projects estimated return in monetary units and the internal rate of return reveals the percentage return needed to break even. In fact the IRR is the return needed for the NPV to hit 0. Further analysis of the difference between the NPV vs IRR can be found in the article NPV vs IRR. 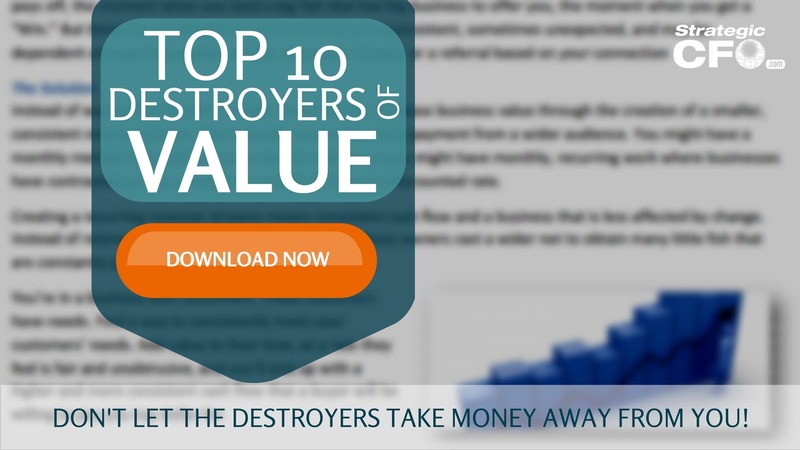 If you’re looking to sell your company in the near future, download the free Top 10 Destroyers of Value whitepaper to learn how to maximize your value. Don’t let the destroyers take money away from you! Contribution margin (CM), defined as selling price minus variable cost, is a measure of the ability of a company to cover variable costs with revenue. The amount leftover, the contribution, covers fixed costs or is profit. Contribution margin means a measurement of the profitability of a product. In addition, express it as a dollar amount per unit or as a ratio. CM can be calculated for a product line using total revenues and total variable costs. It can also be calculated at the unit level by using unit sales price and unit variable cost. The metric is commonly used in cost-volume-profit analysis and break-even analysis. For example, Isabel is the CFO of a private company, the holding company for a series of retirement homes, called Retireco. She has known the owner of Retireco since she was a child, noticing her unique drive to make her company a success. Isabel has turned her family friend into a lifelong business connection and now, having earned her expertise in the accounting world, is her CFO. One day the CEO of Retireco asks Isabel to calculate the CM of her company. Her purpose is to know variable costs, fixed costs, and finally profit are derived from sales. Since she is familiar with it, this is a simple task. Isabel now knows that 85% of sales can move on to cover fixed costs or become company profits. Therefore, she can provide this information to the Retireco CEO with suggestions for how to best use this money for these purposes. By having effective financial ratios, doors open which can lead to further growth of Isabel’s career and the company as a whole. Want to check if your unit economics are sound? Download your free guide here. As you can see, the theater has a contribution margin of $5. That is, the theater makes five dollars per ticket sold. This contribution margin can be used to pay down the theater’s fixed costs. So we divide $30,000 of fixed costs by $5 contribution margin. This shows us that the theater must sell 6,000 tickets per quarter to break even. The cost volume profit equation shows us many important aspects of the business of the theater. Now let’s say the theater doesn’t want to merely breakeven. They actually want to make a profit in the upcoming quarter. Selling 6,000 tickets allows them to breakeven. But how many do they need to sell in order to make a profit of, let’s say, $10,000? We can find out by using the CVP model and the CVP formula. When performing CVP analysis in order to determine the sales volume required for a set target profit, you simply add the target profit to the fixed costs. So we have variable costs of $2, sales price of $7, and fixed costs of $30,000. And now we’re adding target profit of $10,000. Following is how we set up the CVP formula for a target profit. As you see here, the theater must sell 8,000 tickets in order to cover its fixed costs and make a profit of $10,000 in the upcoming quarter. Of course, for illustrative purposes, this is a very simple example. Real-world examples may be more complex and have more variables. But this is a basic version of the cost-volume-profit financial model. Break even analysis, defined as the studying the path to the point where a company is neither losing money nor making a profit, is very important to the survival of any start-up business. Perform it for either products or the business as a whole. The break even calculation can be in reference to pro or post-forma, that is before or after the company has been formed. Once you are able to arrive at the break even analysis you can show the Owner(s)/Management this metric and make it part of their sales planning. Another idea might be to incorporate this metric into the Flash Report review meeting. This way your staff can know on a weekly basis if they are on track to at least breaking even. To learn how to price for profit, download our Pricing for Profit Inspection Guide.